A group of kids ages 8-11 who spent their summer learning entrepreneurship skills in Hong Kong have written a book called How To Be A Good Babysitter in just four days. After only three days of crowdfunding, the campaign, produced by the new Jumpstart Kids program, successfully raised 100% of its goal. With more funding, they’ll be able to start printing their more books and raise more money for the Hong Kong Dog Rescue, a charity that the kids selected for this project. 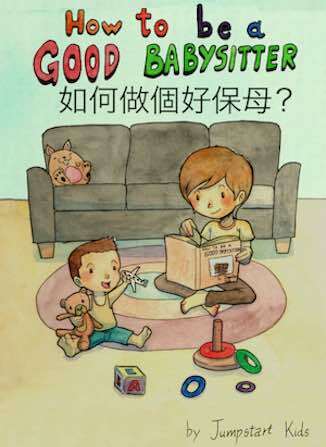 The 38-page book will be in English and Cantonese and filled with 60+ tips and illustrations on how to be a good babysitter. The book is meant to be an introduction for 7-10-year-olds on how how to play with the baby or toddler, what to do if they cry, and what they should and shouldn’t do, like always washing hands before handling the child. Jumpstart Kids is a new program developed by Robbins’s Jumpstart Magazine, a print/online publication for startups in Hong Kong. The goal is to instill a confidence in kids to teach them that they can do anything and they can make a difference. The sale of their book has already been approved at eight Bookazine shops and its publication date is set for October 15, 2016.